Posted on April 19th, by Marcia Loader in News. Comments Off on All aboard for Railroad Days! 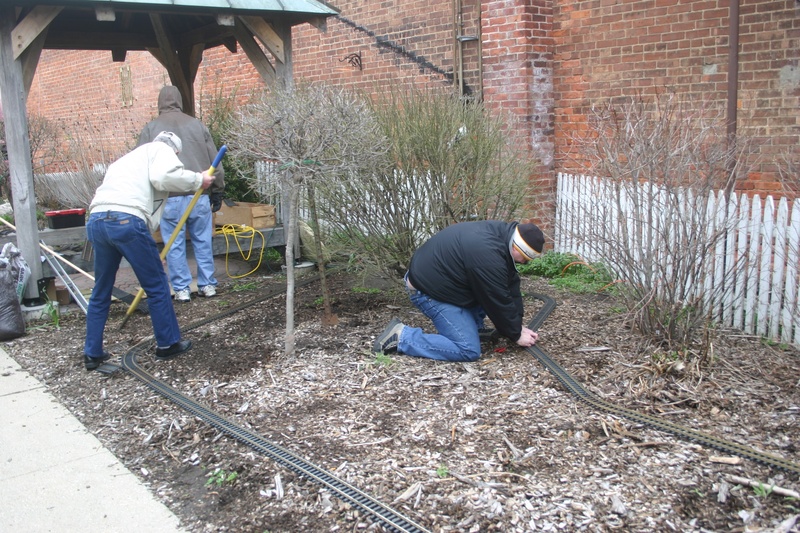 It’s been nearly 180 years since the Erie and Kalamazoo railways tracks were laid across southeastern Michigan and still the railroad tradition remains ever present in the greater Blissfield community. To celebrate that long, rich history with the railroad the Blissfield Downtown Development Authority/Main Street Program has extended the second annual Blissfield Railroad Days presented by McDonald’s of Lenawee County to a two-day affair Saturday and Sunday, April 20-21. One can ride the rails on the “Old Road,” explore static displays of a once busy caboose and an engine at the Adrian and Blissfield Railroad, as well as tour shops, local attractions and homes with the attraction of several different model trains and railroads and buy and sell model railroad items at an indoor swap meet on Sunday. Organizers have extended the event to two days to accommodate the large number of people they expect to visit the village this Saturday and Sunday. To visit most of the exhibits and to keep track of where to go, a $5 ticket can be purchased at the Blissfield Historic Depot on N. Lane St., The Blissfield American Legion, The A & B Railroad and the Blissfield Model Railroad Club. T he event runs from 10 a.m. – 4 p.m. Saturday and and Sunday. Tickets can be presented to volunteers at each location and punched just as an old-time train passenger ticket would have been. “The tickets are good for the whole weekend,” DDA/Main street Manager Patricia Rayl said. Organizers have printed 5,000 tickets in expectation of good-sized crowds over the weekend. There will be three homes open to the public both days where each resident has an extensive model train collection. Frank Baker on S. Monroe Street will again have his large model display running. Doug Tagsold on Danfield Court will show off his HO scale Denver, Front Range and Webster layouts on display that have been featured in “Model Railroader Magazine” This year Clem Krzeczkowski will also open his East Gorman Road home for viewing of his new O sale layout in an “island” layout with a river, bridges, tunnels and other highlights to the display. Several downtown as well as other village businesses will host different model trains and railroad-related activities. This year there will also be what organizers are calling a garden train in the downtown minipark on Saturday and Sunday. On Sunday Engineer Dan will be located in the minipark for photograph opportunities. The Adrian and Blissfield Railroad will give rides. Each ticket bearer can ride the train twice, once from the East Depot to the West Depot and then on the return trip as part of the ticket cost. Brenda Rice of the A & B railroad said train rides are from 10 a.m. – 2 p.m. Saturday and from noon-4 p.m. on Sunday. The A & B Railroad will also have a display of a vintage locomotive ad caboose to tour. Other attractions both days include the Blissfield Model Railroad Club on East Adrian Street that will have its extensive model railroads on display with trains running from 10-4 p.m. both days. Operation Lifesaver will be at the Lane Street Depot to educate the public on rail safety. Another new feature this year is the Lenawee County Voiture Locale 9997 40 & 8 Chateau Trolley. Rayl said it will have drop off points at the Pearl and Jefferson street parking lot to the American Legion. It will also shuttle people to the area of Baker and Krzeczkowski’s homes. This year there are two events at the at the Blissfield American Legion. On Saturday there will be displays of four modular railroads, Rayl said. On Sunday there will be a sale and swap event for model railroad items.